This example uses Mantel-Haenszel method to estimate the effect of household smoking on respiratory symptoms of school children, after adjusting for the effects of the student’s grade and household pets. Suppose that the School data set contains the stratum-specific numbers of cases of respiratory symptoms in a given school year for a school district. Variables Pet and Grade are the grouping variables that form the strata in the standardization, and the variable Smoking identifies students who have smokers in their households. The variables Case and Student indicate the number of cases with respiratory symptoms and the total number of students, respectively. The ORDER=DATA option in the STRATA statement sorts the strata by the order of appearance in the input data set. The "Standardization Information" table in Output 107.2.1 displays the standardization information. The STATS option in the STRATA statement requests that the STDRATE procedure display a "Mantel-Haenszel Standardized Strata Statistics" table for study populations, as shown in Output 107.2.2. The table displays the strata information and the expected number of events in each stratum. The Expected Events column shows the expected number of events when the Mantel-Haenszel weights are applied to the corresponding stratum-specific risks in the study populations. The CL=NONE suboption requests that confidence limits for strata risks not be displayed. With ODS Graphics enabled, the PLOTS=ALL option displays all appropriate plots. With the METHOD=MH and STAT=RISK options, these plots include the strata distribution plot, strata risk plot, and strata effect plot. 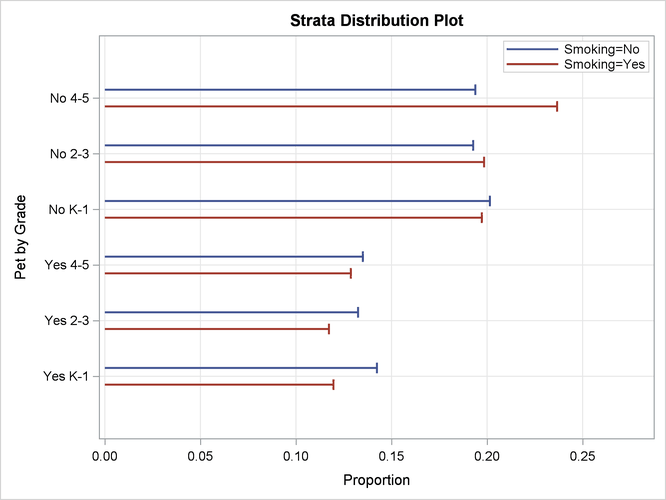 The strata distribution plot displays proportions for stratum-specific numbers of students in the study populations, as shown in Output 107.2.3. 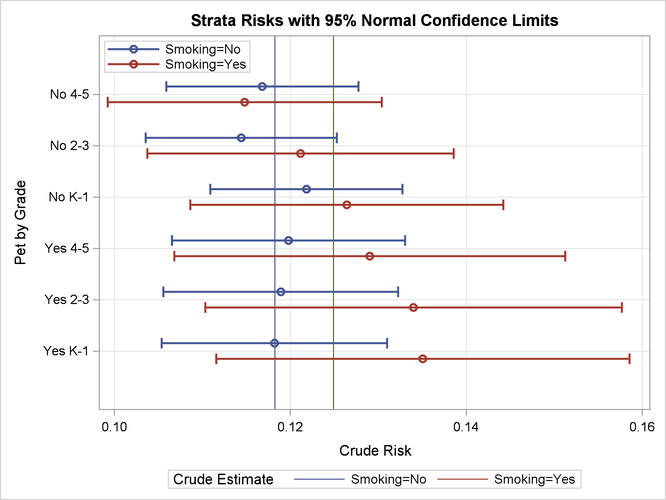 The strata risk plot displays stratum-specific risk estimates with confidence limits in the study populations, as shown in Output 107.2.4. This plot displays stratum-specific risk estimates in the "Mantel-Haenszel Standardized Strata Statistics" table in Output 107.2.2. In addition, the overall crude risks for the two study populations are also displayed. By default, strata levels are displayed on the vertical axis. The EFFECT option in the STRATA statement requests that the "Strata Risk Effect Estimates" table be displayed, as shown in Output 107.2.5. The EFFECT=DIFF option in the PROC STDRATE statement requests that strata risk differences be displayed. The "Strata Risk Effect Estimates" table shows that for the stratum of students without household pets in Grade 4–5, the risk is higher for students without household smokers than for students with household smokers. For all other strata, the risk is lower for students without household smokers than for students with household smokers. The difference is not significant in each stratum because the null value 0 is between the lower and upper confidence limits. With ODS Graphics enabled, the PLOTS=EFFECT option displays the plot with the stratum-specific risk effect measures and their associated confidence limits, as shown in Output 107.2.6. The EFFECT=DIFF option requests that the risk difference be displayed. By default, confidence limits are generated with confidence level. 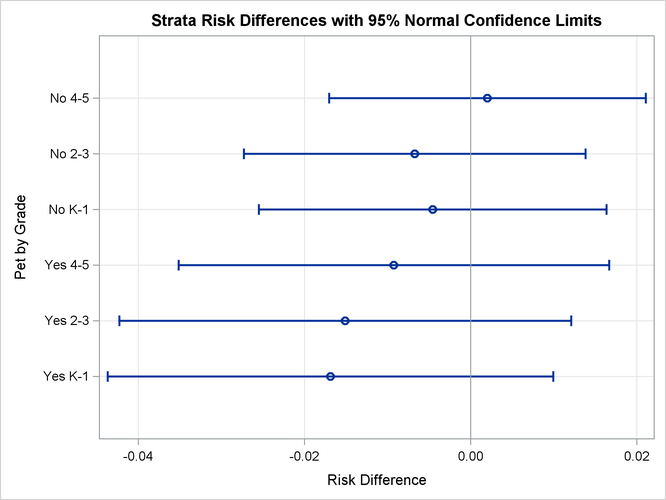 This plot displays the stratum-specific risk differences in the "Strata Risk Effect Estimates" table in Output 107.2.5. The "Mantel-Haenszel Standardized Risk Estimates" table in Output 107.2.7 displays the Mantel-Haenszel standardized risks and related statistics. The EFFECT=DIFF option requests that the "Risk Effect Estimates" table display the risk difference statistic for the two directly standardized risks, as shown in Output 107.2.8. The table shows that although the standardized risk for students without household smokes is lower than the standardized risk for students with household smokes, the difference (–0.00698) is not significant at the significance level, (p-value 0.1418).